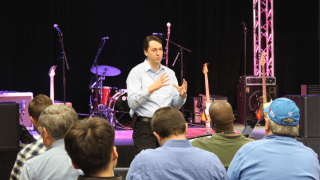 Sound Productions, an Irving, TX-based integrator that has served the pro audio and commercial audio industry for 44 years, hosted a Technical Arts and Team Leadership Seminar on February 16 with a focus on best practices for houses of worship. The seminar was held in the company’s training facility and featured presentations by David Leuschner, senior director of technology and technical arts at Gateway Church in Southlake, TX. Leuschner shared with attendees his vast experience working with an array of personalities and talents, and addressed topics such as how to lead when you are not a manager, how to plan through learning from the past, how to solve issues without making excuses, and how to best communicate your vision. As a member of the senior team at Gateway Church, Leuschner provides oversight for all technology and live production. Gateway Church is located in the Dallas/Fort Worth metroplex and currently averages 30,000 attendees per weekend.